During 1965 and 1971 two brief but furious wars flared up between India and Pakistan. The first lasted 23 days and saw the PAF pitting its F-86Fs, F-104s and B-57s against the IAF’s Hunters, Vampires, Gnats, Ouragans, Mysteres and Canberras. Losses all round were severe. To recoup its losses, Pakistan took three main steps. Because of an arms embargo, it was cut off from its traditional source of supply, the United States, so turned to France for a limited supply of Mirages (these were too costly for the PAF to obtain in the numbers it needed). It turned to China for a large number of F-6 Fighters. These are a version of the MiG-19 and have been to this day an affordable but reliable (if outdated) aircraft. Finally, Pakistan looked for anv available “bargains” and, as it turned out, found an excellent one. A large batch of Luftwaffe Sabre 6s were currently surplus. Working no doubt with seasoned international arms dealers, Pakistan agents concluded a deal which saw the Sabres purchased by Iran. Some 90 were ferried to that country by Luftwaffe pilots. Once there so the story goes, they were flown into West Pakistan “for overhaul.” They never returned and were soon flying with PAF squadrons. The Sabre 6 was an ideal find for the Pakistanis—it was inexpensive and was readily serviceable; PAF fighter pilots had been brought up on the F-86F, yet the Sabre 6 was a good half generation advanced over the “F”. The Canadair Sabre was to form the backbone of the PAFs day fighter operation in the 1971 war and would fly again%[ vastly superior numbers of IAF fighters, including the Gnat, Hunter, Mystere HF-24, SU-7 and state-of-the-art MIiG-21. In 1971 Last Pakistan was in turmoil and the movement by revolutionaries to reform it as an independent slate destabilized the region. In December India launched an all-out invasion of East, then West Pakistan. All the PAF had in the East was a single squadron of Sabres. Too small to take on the Indians offensively, Pakistan had little choice but to try holding on its own frontiers. Unfortunately for the PAF, many of its new F-6s were not vet combat ready. With few Mirages available, it was the Sabre 6s, along wish the surviving F-86Fs, that would have to fend off the Indians. It appears that the first. engagement in the air war occurred on November 22, with Gnats and Sabres dog fighting over East Pakistan. One Gnat and two Sabres were lost. From here on activity rose and after the first four days of fighting in December the PAP had claimed 95 enemy aircraft shot down in combat-a high figure, but it has been widely accepted that the PAF made excellent use of its aircraft and did, in fact, establish a high kill ratio against the IAF. A typical day’s work was December 6 when five SU-7s, three Canberras and two Hunters were shot down for the loss of two Sabres. On December II PAF Sabres also did well: a supersonic MiG-2I and two SU-7s were bagged. Three days later a MiG fell to an F-6. On the 17th, a Sabre brought down another MiG-21, bringing the PAF tally to 141 enemy aircraft destroyed. That day India agreed to a cease-fire. It is the official Pakistan view that the tenacity of the PAF and the way it established air superiority led to India’s sudden acceptance of the cease-fire. Without control of the skies, India apparently felt that victory couldn’t be assured. By far the most active PAF fighter in the 1971 war was the F-g6, and it would appear that a large number of Sabre 6s participated and accounted for many of the 141 PAF kills. Thus, in its “declining years,” the mighty Sabre 6 had finally been put to work “for real.” And the results, for those on the receiving end, proved devastating. PAF records show that 24 Sabre 6s were lost in 1971, most, it is safe to assume, during the war. These Canadair Sabres (F-86E) belonged to Canada’s most widely produced aircraft with approximately 1800 manufactured in all. This epoch making fighter built under license by Canada continued to fly in the air forces of a number of countries and was extremely popular in the PAF right up to its phasing out in 1990 due to spares supply having completely dried up. 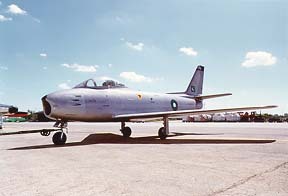 PAF’s F-86Es were allocated in (the former) West Pakistan to No. 17, 18 and 19 Squadrons and No. 14 Squadron in (the former) East Pakistan (now Bangladesh). In the 1971 Indo-Pak War, air combat operations by E-86E.s were of great historical significance and interest. Some selected and salient war events involving the Canadair Sabres are summed up in the following paragraphs. The resource constraints permitted the PAF to station only a single squadron (No. 14) flying I’-86Es in the then Eastern wing of Pakistan. This lone squadron had to face no less than 10 squadrons of the Indian Air Force (IAF) simultaneously, comprising MiG-21s Gnats and Hunters. The grim but resolute and heroic resistance of No. 14 Squadron will go down in air combat history as a glorious chapter of a valiant and determined fight against a vastly superior enemy. It was a no win situation front the outset, but the squadron Put up a fierce fight and continued it against heavy odds. I he young and gallant pilots of PAF, with only 1011-150 operational hours to their credit, were invariably pitted against eight to ten enemy aircraft at a lime. The citation in fact describes actions very typical of No.14 Squadron’s war effort. The objective of the small but dedicated team of PAF men was to protect Dacca airfield from hostile attacks and to keep it safe enough for continued operations. In this mission their resolute performance was acknowledged even by the adversaries. With the launching of an all-out assault by Indian forces on East Pakistan on November 22, 1971, the IAF let loose the full combat power of its 10 squadrons against one. The IAF kept on relentless pressure for three days and nights. Dacca Air Base was raided several times by as many as 20 aircraft simultaneously. But for the dogged resistance and will of t lie PAF, the W. would have succeeded in achieving their objective within three to tour hours of the first day. But the heavily outnumbered but determined pilots of 14 Squadron did not allow the IAF such an easy victory The PAF F-86s rose repeatedly to meet MiG-21s, SU-7s and Hunters to inflict casualties on the intruders notwithstanding the ladder’s overwhelming superiority. A memorable dogfight in the defence of Dacca Air Base, amongst the many witnessed by newsmen from the nearby roof of the litter Continental Hotel, involved the young Flying Officer Shamsul Haq. He alone engaged five enemy aircraft and shot three of (hem down, two Hunters and one SU-7. F/O Shams, though quite young in flying experience as well as age, engaged each enemy aircraft in turn and got his kills through a blend of aggressiveness and .skill. Realizing the ineffectiveness of SU-7s. the IAF effected a qualitative as well as a quantitative change in then air element by introducing supersonic and better maneuvering and more powerful Mig-21s along with the Bunters. This uneven grim tussle tot- air superiority between the two unequal rivals dragged on until December 81b, when Dacca runway. having been cratered too many times, was irreparably damaged. thus bringing PAF operations to an inevitable end. The Indians, however, tailed to destroy No.14 Squadron. Even when the runway had been rendered non-operational, I t F-86Es remained intact. Air war in the then Western wing of Pakistan was a different proposition. The PAP held full sway over her air space and the air superiority gained by the PAF was seldom contested. In the initial 24 hours after the outbreak of war, the IAF suffered the loss of 19 aircraft including 9 S4-7s, 5 Hunters, 3 Canberra%, I HF-24 and I Gnat. In several encounters the F-86E easily outmaneuvered IAF aircraft and in one case this pilots’ favorite shot down even the much faster MiG-21, when the latter attempted unwisely to turn with it, in a tree-top dogfight. Summary of PAF Sabre 6s to 1986. Sabre F-86 North American Sabra F-86 served with distinction with Air Forces of new ferwer than 37 nations. Overall, an impressive tally for an aircraft which is generally regarded as the ebst fighter if its era because of its excellent combat record on Korean war, its technical achievemnts, it was far in advance of the jet fighters which immediately preceded it. The PAF sabres were extensively used during 1965 and 71′ war in combat air patrol, strike against airfields and close support mission. Several air battles between Pakistani and Indian aircraft took place, the Sabre pilots ultimately claiming numerous kills including Hunter, Gnats, Vampires, Mysteres and a Canberra among them. In 1971 war, PAF had 6 Sabre Squadrons; NO 14, 15, 16, 17, 18 and 19. At the end of the war, 11 remaining Sabres of No 14 squadron were destroyed delibrately to avoid capture, although Sabre pilots once again made their mark and despite the age of their aircraft claimed Hunter, SU-7, Gnat nd even a pair of Mig-21s. The Sabre remained in PAF service untill 1980. At the end of ’71 war, Bangladesh had five Canadian Mk.6 Sabres which fell into their hands after some defectors fled to the East Pakistan (Bangladesh). There are also rumors that out of these five Sabres, some were construced after mutilating the 11 destroyed Sabres of No. 14 Squadron and the remaining spares. 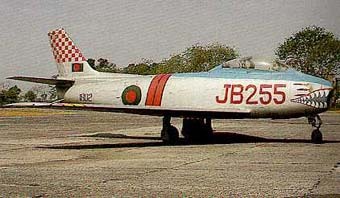 These Sabres operated by Bangladesh Air Force for on;y two years until a lack of spare parts forced their withdrawl from service. History of PAF Sabre starts after the Korean war, when USAF realized Mig-15 was much better fighter and Sabre needed much work on it,specially rate of climb. F-86Fm the day fighter variant which pakistan acquired embodied a much improved airframe. Combat experience also revealed a need for enhanced manoeuvrability, resulting in the development of the so called ‘6-3′ wing with leading edge slats removed. With this modification installed, the Sabre was able to out-turn a Mig-15 and its high altitude/high Mach number manoeuvrability was considerably enhanced. The F-86 was powered by the J47-GE-27 engine rated at 5,910lb thrust, a 13 per cent improvement on A and E models. This resulted in greater speeds but a significantly improved rate of climb – in the order of 25 per cent at sea level – although this was still slightly inferior to the Mig-15. The final varint of F series, was the F-86F-F40. It had a curious mix of wing features. In order to restore the previous low speed docility and reduce the stalling speed, the leading edge slats were reinstated and each wing tip extended by 12 inches, resulting in a an overall wing span of 39ft 1.4 in and wing area increased to 313.4sq ft. The result was a stalling speed some 17 knots below that of the F-86F with ‘6-3′ wing. Powerplant One 5,910lb thrust General Lelectric J-47-GE-27 axial flow torbojet; internal fuel capacity 437 USgal (1,654 l) and/or two 120 USgal underwing drop tanks. Armament Six 0.50in Browning M-3 machine gun in nose with 267 rounds per gun; four underwing hardpoints for drop tanks or two 1,000lb on inboard points; alternatively 15 5in HVAR rockets. Rolling a gleaming, newly painted Sabre Jet into a hangar for the first time is a sight everyone will remember but very few will ever experience. Four hundred guests assembled at the Western Canada Aviation Museum (WCAM) in Winnipeg on 8 August 1997 for just that experience. The museum was about to welcome Canada Sabre #1815; the last Sabre ever built in Canada, into its already impressive aircraft collection. The story actually began a number of years ago when the WCAM sent a letter to the Pakistan Air Force (PAF) inquiring about the possibility of acquiring a Sabre that was about to be retired from the PAF’s active service list. Built in Canada, the Sabre represented the leading edge of modern jet technology in the 1950’s and as a result served in Air Forces all over the world right up to the 1970s. Not receiving a reply to the request, the WCAM went about its business until 1996 when the PAF’s Air Commodore Kamran Qureshi contacted the WCAM to see when they were coming to get their airplane! With the wheels now in motion and with the help of 435 Sqn, the museum was able to retrieve the Sabre in May of 1996. Tragically, the very helpful and generous Air Commodore died in a drowning accident within hours of seeing the Sabre off to its new home. Back at the museum, preparations were being made to restore Sabre #1815 to its former condition. 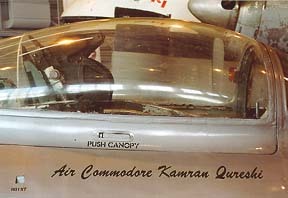 The decision was made to honour Air Commodore Qureshi by painting the Sabre in PAF colours and to add the Air Commodore’s name on the rim of the cockpit. Winnipeg 402 Sqn took on the task of restoring the body of the aircraft and Air Canada donated the time and skill to paint and apply the markings. On 8 August the Sabre was ready and the WCAM’s guests gathered in the hangar to hear fascinating speeches by former RCAF Sabre pilots Andy MacKenzie, Syd Burrows, and Jim Pugh. Also providing welcoming remarks were Pakistan delegate Dr. Khalique Ahmed, MP John Harvard. WCAM President Bill Tweed and Executive Director George Elliot. As Jim Pugh raised his champagne glass in salute, the hangar doors opened and the Sabre moved forward in to the Museum to the strains of the Air Force March past. It was a very dramatic and touching moment that brought some to the point of tears. The Sabre now has a place of honour in the Western Canada Aviation Museum’s permanent collection and can be seen by the public.